Further to the seminal decision of R v Waya  UKSC 51, a further authority (the decision of R v Reid EWCA Crim 628) arose. In this case, the court addresses the issue of how benefit should be calculated when a property has been fraudulently re-mortgaged. 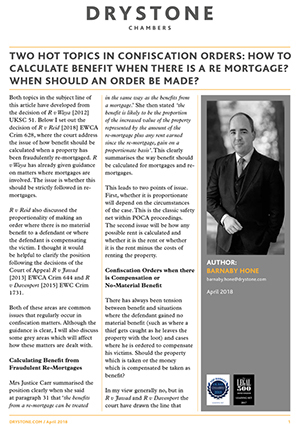 In the following article, Barnaby examines the benefit calculations and the thorny issue of when an order should be made.